Phoebe Rose was born on August 8th, 2010. A beautiful, healthy and strong baby girl. Just over two months later, she was diagnosed with mixed lineage (MLL+) infantile leukemia. This is an aggressive and difficult to treat and cure leukemia with a very poor prognosis – just 20% of babies with high risk disease survive five years. Phoebe endured months of chemotherapy and a bone marrow transplant, only to relapse shortly after. Phoebe’s family were told there were no treatment options and advised to take her home. Instead, they decided to try clinical trials and experimental treatments and moved to Toronto to pursue further therapy. Phoebe’s journey and search for a cure later led her and her family from Ottawa to Toronto SickKids to St.Jude Children’s Research Hospital, back to Ottawa and then following another relapse, to the Children’s Hospital of Colorado and back to St. Jude. Thanks to research, Phoebe’s disease responded to treatment with a second bone marrow transplant and she was able to stay in remission for two and a half years. Phoebe thrived and learned to walk, talk, jump, sing, dance, run, read, draw. She loved to ride her bike and play with her big sister and best friend, Mae. She loved to cook with her Daddy and appreciated good food. Phoebe inspired her community and touched people around the world. She lived life to the fullest and although she had cancer; she was not a sick girl. She was feisty, determined and brave. To know Phoebe was to love her. 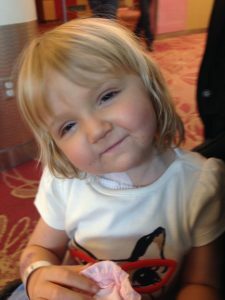 Phoebe died in the ICU at St.Jude Children’s Research Hospital on November 18th, 2015. She was 5 years old. She taught us to love greatly, to laugh even when it’s hard, to always find time to play, to live without fear, and to always look for the joy. Her journey with cancer taught us to never give up and opened our eyes to the need for more research for better treatment options and cures. The Phoebe Rose Rocks Foundation was founded in honour and memory of Phoebe Rose. Phoebe would often say that living with cancer as a child was “not okay” – this is our way of helping to make it okay. Phoebe will always be our beautiful, bright, and shining star.